The great thing about having a patio is that, not only does it give you a place to enjoy the outdoors, it can also be a true extension of your home. You’ve heard the phrase “bring the outside in.” When you’re decorating a patio, you should also “bring the inside out” to give the space a touch of the same personality that lives inside your home. The patio shouldn’t be a complete style departure from your home’s interior. Rather, it should continue the flow and reflect your taste and style. Below you’ll find my top ten tricks for creating the perfect patio. 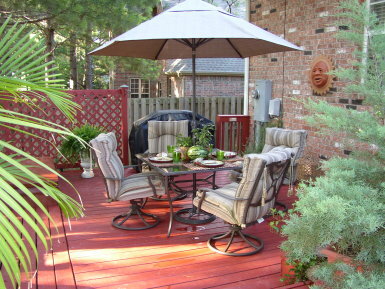 Try to set up your outdoor space according to how each area will be used. 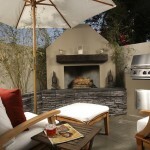 Create one zone around the grill or fireplace and another surrounding a pool or hot tub, if you have one. You may also want to create a separate conversation area that’s a bit more tranquil and separate from the kids’ play areas. Make sure to furnish it with enough outdoor furniture, tables and outdoor rugs and lamps to give it that “sit and stay a while” feeling. Lighting is a “must do” for outdoor areas like patios. The right lighting will give it the ambience that makes it a truly special place to be even well into the night time hours. If you have a deck that gets a lot of sunlight during the day, you could surround it with solar lights that will then glow all night. Solar lights are a great way to avoid having a lot of expensive electrical work done. Outdoor lamps are also a great solution, and you should incorporate them the same way you would in your living room and surround the area with lights. I also like it when people extend the lighting out into the yard itself with up lights on the trees or spotlights showing off a beautiful flower bed or shining on a favorite statue or pond. In a home, the wrong floor plan can really hinder your ability to enjoy the space. It’s equally important to consider traffic flow when you’re organizing your outdoor spaces as well. If your access to the patio is through the kitchen, put your barbecue grill and food preparation area closest to the house so you can easily transport food in and out. If the patio comes off your bedroom, the first thing you should see is a relaxing area – perhaps a spot for reading or a great-looking hammock. If your patio is off the living room, it’s great to extend that living room feeling into the outside with another conversation area. If you’re lucky enough to have a pool in the backyard, try to set it up so that guests coming inside from the pool enter through a room with tile floors instead of carpeting – something like a mud room or laundry area. If you often invite large groups of people over for an outdoor party, make sure you create a space that’s open enough to accommodate the group. It’s awkward when you’re part of a large group and everyone is hovering around the only three or four chairs available. For big groups, create more than one outdoor room setting because people tend to clump together in different spots. You can also extend your groupings out onto the lawn itself. Most people know that a patio begs for plants. Make sure you choose plants that add not only color but also different textures. Have a variety of plants of varying heights – some flowering and some just green. Don’t forget to include a few beautiful ferns, and add some interest with a variety of different planters, too. Though it’s a simple ingredient, plants really do make a huge difference in the overall feel of your patio. As crazy as it might sound to use a fireplace or fire pit in the middle of summer, having one on your patio can enable you to use the space year-round. If your patio doesn’t have a built-in fireplace, a portable or semi-permanent fire pit can be a great solution and will add a cozy ambience for your outdoor gatherings. People just tend to relax and settle in around a fire, and it can be the perfect backdrop for those long conversations on the patio or deck. Make sure to shop around and see the various styles of fire pits before you choose one. 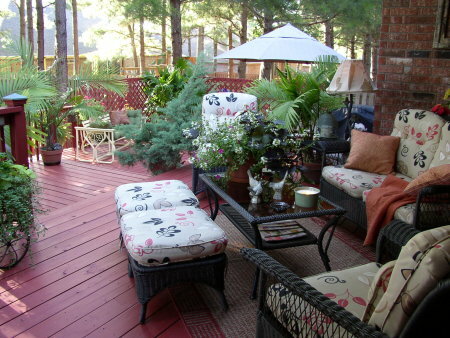 One of the things clients request most in their outdoor space is a place to relax. You don’t necessarily have to be in a camping tent to “get back to nature” and enjoy nature’s beauty. Create a space on your patio for pure relaxation – reading, meditation, yoga practice or even napping. Be sure to bring in the sounds of nature by including a fountain or pond with running water. If you have a covered patio, a ceiling fan can add some nice, gentle movement and a relaxing breeze. Incorporate wind chimes, if you find them to be pleasant, but skip it if they’re a little too annoying. If you’re hosting a party on the patio, people need to eat. So having some sort of outdoor kitchen space is a must. Some custom homes have an entire kitchen built into the patio. But if your home is like mine, you’ve got to figure out a way to create a kitchen space around a simple bar-b-que grill. People will always gravitate to the area where the food is, so make sure to create a large enough space to accommodate them. Make some seating areas and include a big, galvanized tub full of ice and drinks. You could put the tub on a table top or on an iron stand. Be sure to have enough tables on hand for seating as well as serving the food. Make the kitchen area a fun, festive place to hang out. Choose accents for your patio so that they’re in line with your personality and continue the flow from the rest of your house. Flowering plants are a must. Also include outdoor rugs, pottery, gates, sculptures and natural materials like stone or even tree stumps. Give your patio some personality, too. Include a fun or unusual conversation piece – like a statue, wall hanging or unusual tile. People will gravitate to it and start asking questions. It can be something fun or something personal to you. Gazing balls can add a touch of whimsy, and, if you have the time to maintain it, a coy pond is always a great addition. Installing an arbor, pergola or gazebo can give you the opportunity to create a beautiful “viewing area.” The gazebo could also double as your “relaxation station.” I saw one gazebo in a magazine recently that had a large wooden swing installed in it that faced out toward the children’s play area. It looked like the perfect spot to sit and snap photos, read a book or just enjoy watching the kids play. Sometimes arbors are extended off the house to create more shade, which can be enhanced by letting vines grow over it. Your arbor area could function like a breezeway or an entrance into a larger garden area. Fill it with flowers and shrubs. This type of structure is also a great way to divide a more adult space from the kids’ play area. Teresa Huddleston is an interior designer and owner of Huddleston Designs. She also specializes in “re-design,” taking what you already have and recombining it for a completely new look. You can e-mail her at thuddleston7183@att.net or by calling 479-871-4116. Ready to re-FRESH a room in your house?